Bathroom rugs as part of your bathroom interior design or motif should not be neglected--after all, they would be covering most of the bathroom floor. Choosing the right bathroom rug is important for various reasons: safety, practicality, and aesthetics. Below is a guide to help you choose the right rug for your bathroom. You may not have thought about it, but the right bathroom rug can make your day, and the opposite is also true – the wrong bathroom rug can help ruin your morning. After taking a long nice bath, or stepping out of the shower, chances are you’ll want something warm and soft to step on instead of the cold tile. Cold shock in the morning isn’t exactly the best way to start your day. Unless you can afford heated tiles, a quality bathroom rug is your best bet at making each bath a warm, relaxing experience. When you’ve decided on the feel and texture you want for your rug, it's time to consider the basics and the practical side of bathroom rugs. 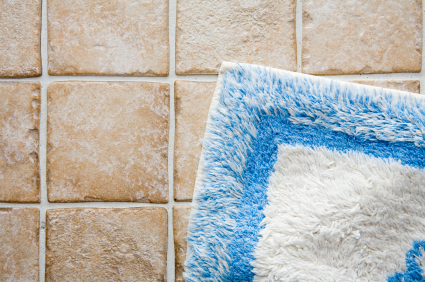 Your bathroom rug should be durable and low-maintenance. Look for one that can be washed by hand or machine, and does not have any special washing instructions. Make sure it can hold up even in the dampest and warmest areas of your bathroom, such as under the sink or in the shower area. Rubber mats offer the best protection, but they tend to look tacky, and you won’t have a lot of color options. What you can do is put the rubber mat under a richer, plusher rug, occasionally replacing the latter to keep it from wearing out. One of the most affordable ways of remodeling your bathroom is by playing with different colors, patterns, textures, and designs. You can do this with bathroom rugs, too. The bathroom rug can accent your motif or even serve as the focal point of your bathroom. For example, if you want to remodel the bathroom into a children's bathroom, you can place a bathroom rug with a cartoon character or animal print and change the shower curtains, toilet seat covers, hampers, toothbrush holders, dispensers, and tissue holders to match the theme.